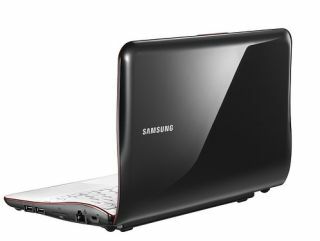 Samsung has announced the NF series of netbooks, describing it as a 'powerhouse of practical technology'. The NF, like its bigger brother the Samsung SF series laptop – features a new design, and it has been given a UK release date of October. The range consists of the NF310, NF210 and NF110 – and as you would expect it is the first of these that offers the highest specs. "Equipped with enhanced mobility and innovative design, the Samsung NF310 netbook is just what you need to express yourself," says Samsung. "A crystal clear HD LED display and unique surround sound system, together with the new Intel Atom N550 (Dual Core) processor, DDR3 memory and Windows 7, take netbook computing into a whole new dimension of multimedia performance. "NF 310 is also designed to enjoy HD movies and images that are clear and picture perfect even in bright light with a high resolution (1,366 x 768) widescreen and a proper 16:9 aspect ratio." Samsung is also offering the equally funky looking but less impressively specced NF210 and NF110. "NF210 makes any time, anywhere mobile computing a practical reality by uniting an extensive battery life of up to 14 hours (6 cell 8850mAh battery) with its ultraportable and stylish design," explains Samsung. "NF110 gives trend-setting consumers all they want in a netbook at an affordable price. With extensive quality assurance testing and a majority of its components manufactured by Samsung, it affordably delivers exceptional reliability and long-term value."